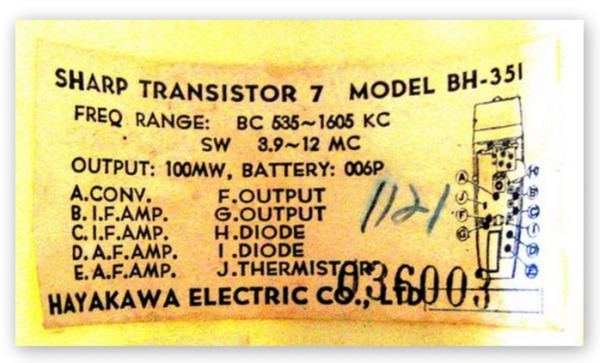 "The most talked about shape in transistors - Sharp's new "Tranket" - designed for the Space Age." 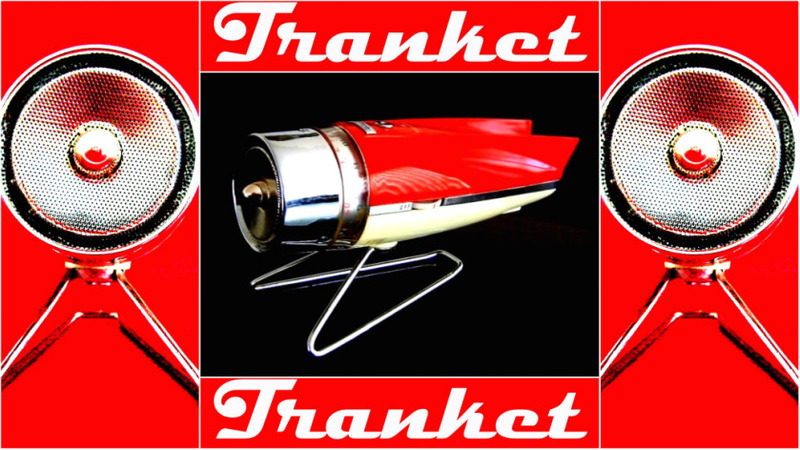 Sharp calls this 1959 rocket radio the 'Tranket' derived from TRANsistor rocKET (see the advertisement below). This fantastic radio was manufactured in Japan at a time when the public was going crazy for all things 'space age'. 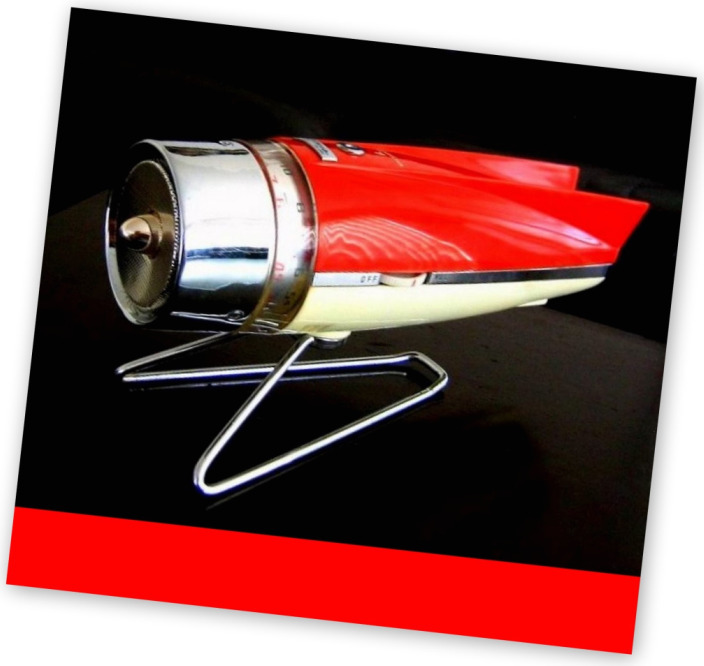 It features futuristic design inspired by classic car culture, the space race and the atomic age. This type of design is most commonly seen in 1950?s architecture such as coffee shops, motels and bowling alleys. It is sometimes referred to as ?googie design? 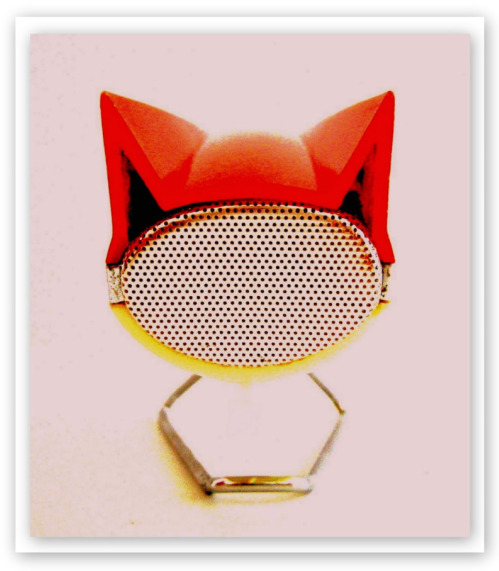 and highlights the use of curvaceous, geometric shapes, bold angles, and pop-culture imagery. This model operates on both the medium wave and short wave bands. The volume control and band selector are found on opposite sides of the body. 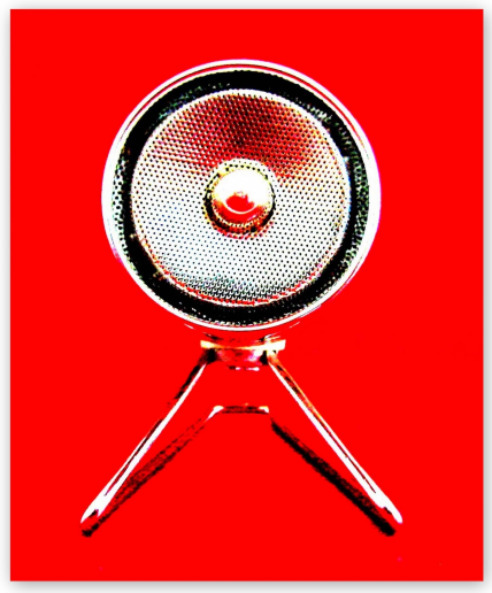 The speaker is inside the chrome nose cone. To operate the tuning dial simply turn the nose cone in either direction. Its metal stand screws into the bottom and this must be removed to access the battery compartment. It measures 8.0? L x 3.7? H (205mm L x 95mm H) and has Conelrad Civil Defense markings on the tuning dial. There is a variant of this radio, the BH-352 that I believe operates on the medium wave band only. There is a turquoise Sharp BH-351 on display at the Sharp Memorial Hall in Tenri City Japan. 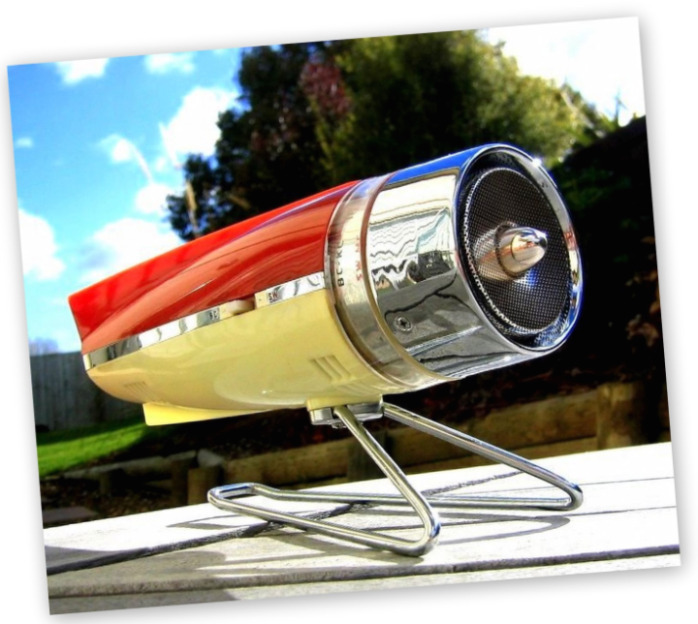 This is the type of radio that the Jetsons would have listened to whilst whizzing around the rings of Saturn or relaxing at Neptunes Health Spa! 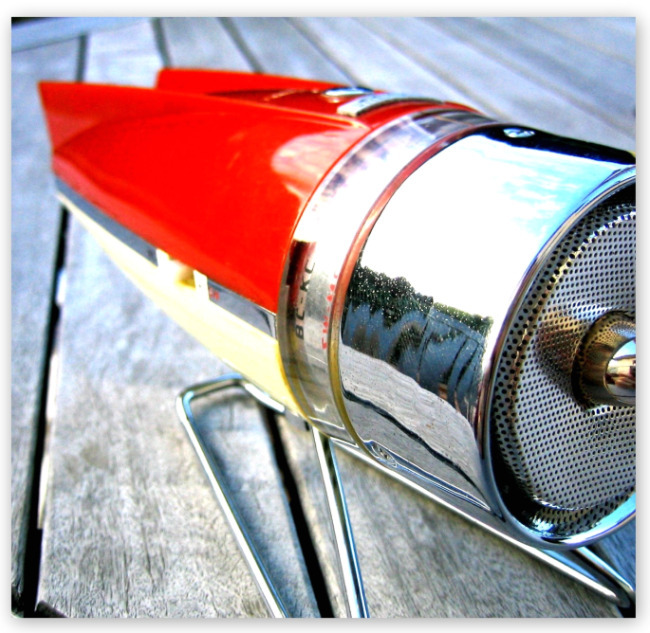 This Sharp BH-351 features sleek fins, streamlined contours, chrome accents, and a two tone red and white plastic body. Its rear end resembles that of a 58 Buick. 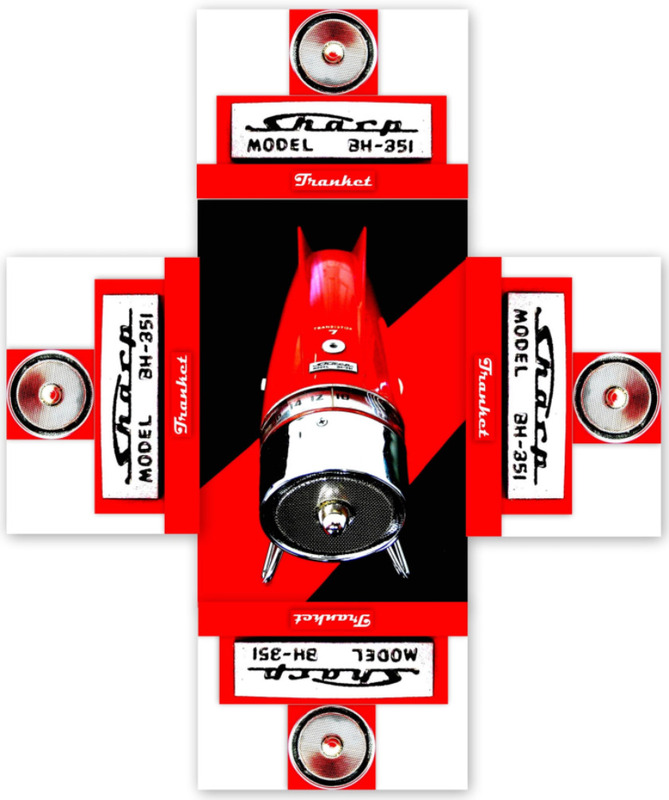 This Rocket Radio came to me via auction site Trade Me. It was listed as being part of an old suitcase full of 'treasures'. There were some interesting items in that suitcase but for me this marvelous radio is definitely the jewel in the crown! See the suitcase here here along with photos from the listing. Sharp was founded in 1912 by Tokuji Hayakawa as a small metalwork shop in the center of Tokyo. The first product that they manufactured was a patented belt buckle. In April 1925 Sharp produced Japan's first working radio in the form of a crystal set. In 1928 Sharp began selling tube radios. 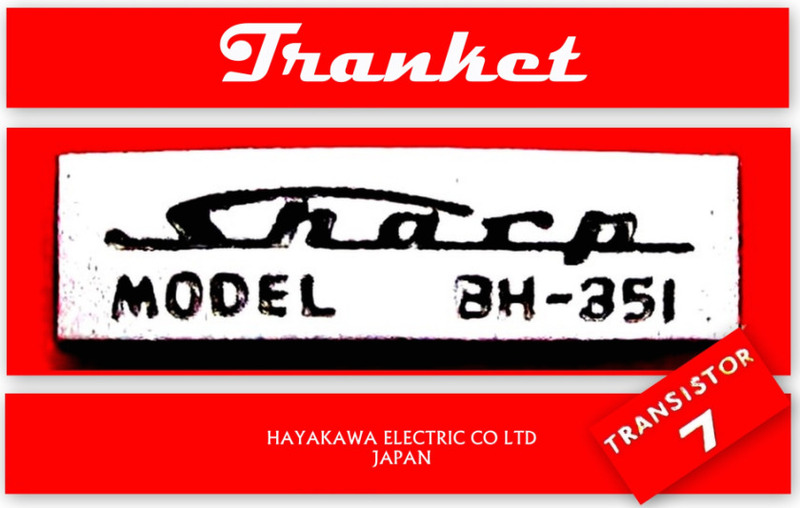 In 1942, the company reverted to its original name of Hayakawa Electric Industry Co Ltd but still continued to sell products branded as Sharp. 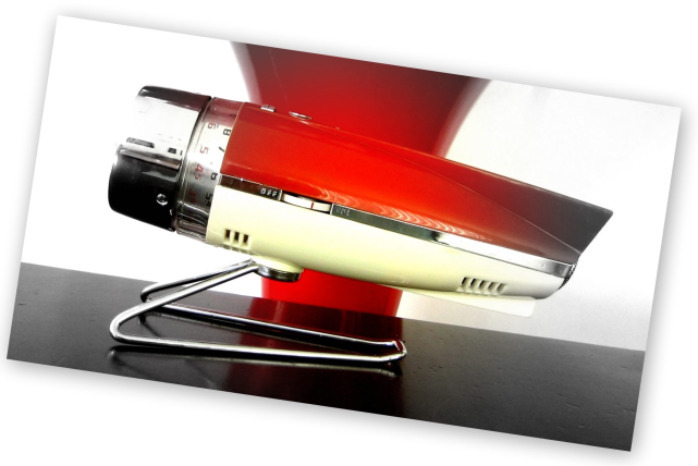 In 1959 after further expansion Sharp began to manufacture and offer a full range of consumer electronics. 1959 advertisement for the Sharp Tranket. 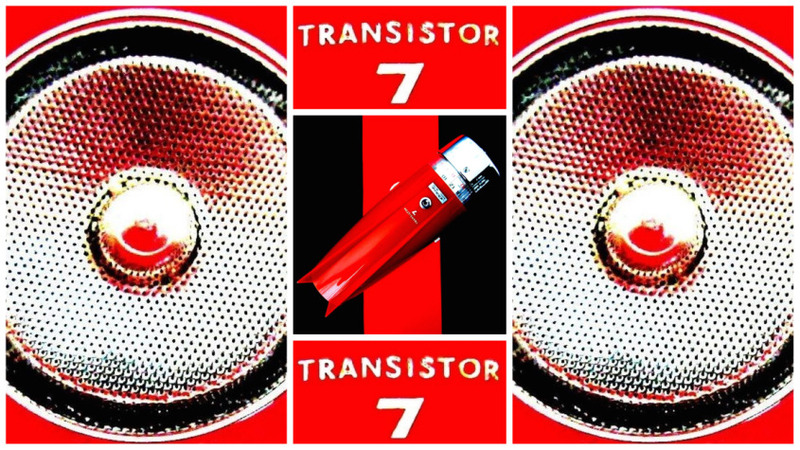 This Sharp uses seven Hitachi transistors.